The first installment of a six-part investigative series by the Boston Globe claims former New England Patriots tight end Aaron Hernandez was sexually molested as a boy. The newspaper’s acclaimed “Spotlight” investigative team researched Hernandez’s life from birth until he killed himself in prison. Hernandez was sentenced to life in prison for the 2013 killing of friend Odin Lloyd. Using “interviews, thousands of court and government records, text messages, emails and images Hernandez sent,” and nearly 300 phone calls Hernandez received while in a Massachusetts prison, the Globe uncovered secrets about Hernandez’s life that revealed a tumultuous childhood that included sexual abuse, drug abuse and questions about his sexuality. Here’s how ESPN sums up the incredibly long but worth every word Globe piece. • Hernandez and his brother, Jonathan, were often beaten by their father, Dennis, while growing up in Bristol, Connecticut. The beatings were sometimes related to Dennis Hernandez’s drinking. • Aaron Hernandez started smoking marijuana in high school with a teammate before school, before football practice and after games. • The teammate, Dennis SanSoucie, told the Globe that he had a sexual relationship with Hernandez in junior high and high school and that the two tried to hide it. • Jonathan Hernandez told the Globe that Aaron Hernandez disclosed later in his adult life that he had been molested as a young boy. One of Aaron’s lawyers in his criminal case also said Aaron spoke to him of sexual abuse as a child. Neither was willing to identify the perpetrator to the Globe. 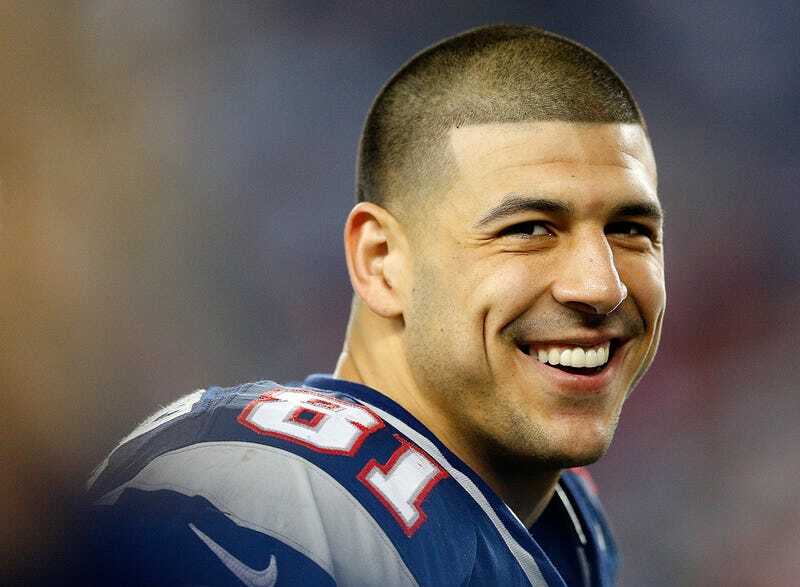 • Aaron Hernandez was close to a cousin, Tanya Singleton, and he was crushed when he learned that his mother, Terri, was in a serious romantic relationship with Singleton’s husband, Jeff Cummings. On April 17, 2017, Hernandez was found not guilty of two counts of murder. Hernandez had been accused of killing two men in a drive-by shooting some five years earlier outside a Boston nightclub. On the same day Hernandez was found not guilty, author Michele McPhee appeared on the “The Kirk & Callahan Show” to talk about her new book, Maximum Harm, a look back at the Boston Marathon bombing. The hosts and McPhee began discussing a possible motive behind the Hernandez killing of one-time friend Lloyd. The hosts and McPhee began joking about Hernandez’s sexuality and rumors they’d heard, calling him a “tight end on the field” and a “wide-receiver” off it, the New Yorker reports. Two days later, Hernandez was found dead hanging from a bed sheet in his cell. He’d scrawled the John 3:16 Bible verse across his forehead and on his cell walls in blood.